One of the fun things about writing for this website is that I relive previous experiences. After a number of weeks, I usually end up with a general impression of a dinner or lunch. Reading my notes, looking at my photos and trying to find the right words bring back the details. Our lunch at restaurant Abantal in Seville was yet another chance to relive a remarkable culinary experience. While I write this I can taste the dewlap, the rose infusion and the Moorish cream again. Yes, it tasted moreish at Abantal. Let’s not beat around the bush, our lunch at Abantal was one of those memorable meals where everything was perfect. 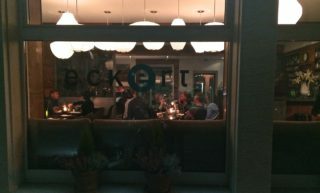 The dishes, the service, the wine, they formed a harmonious ensemble. To start with the food, not one of our ten courses was out of tune; some were extraordinary. Take the snapper belly with snow peas and Iberian pork dewlap. Dewlap? It is the often loose skin of the pig’s neck. 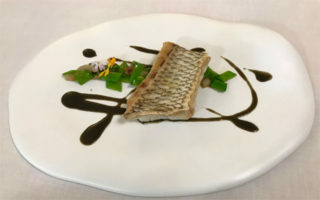 Its soft fattiness added richness and silkiness to the dish that was further refined by a briny squid ink sauce; an exemplary merger of tierra y mar. 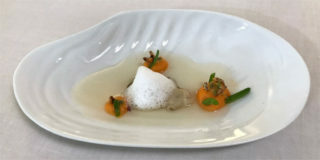 Or take the oyster with citrus foam, a subtle infusion of rose, almond and the tiniest bit of passionfruit, and dollops of mashed sweet potato topped with salicornia, a plant that grows in a salty environment. Seville was the main port of the Spanish empire. If you walk along the Guadalquivir River, where the boats to and from South America were moored, it is fascinating to imagine how the Sevillanos started improvising with new ingredients such as the sweet potato. The menu was full of witty notes too. 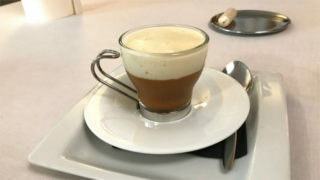 Our third course, for instance, was a “cappuccino” of Andalucian brown beans with a hint of sweet paprika and a caramelly potato foam served in a coffee cup. Witty; velvet deliciousness too. 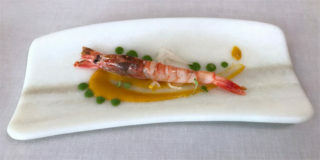 Then there were the regional accents, such as a fantastic red prawn with seaweed, pickled veg and an orange sauce, of which the tanginess perfectly complemented the oceanic tones of the prawn and the seaweed. A meal in Seville without oranges would not be complete! Although ras al hanout is used all over the world these days, with several centuries of Arab rule, it feels like a local ingredient in the Andalucian capital, thus making the caramellized lamb sweetbread with Moorish cream and beetroot a favorite. 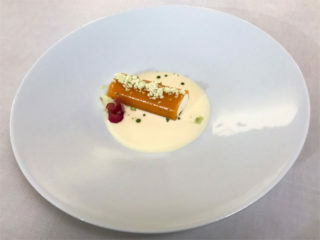 Chef Julio Fernández Quintero knows his classics too. 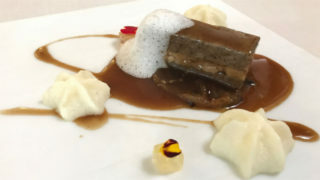 Our main course was a layered preparation of duck and foie gras with a stew of onion and prunes and a gel of muscat grapes served with a light creamy apple purée. How traditional flavor combinations can still surprise and satisfy! 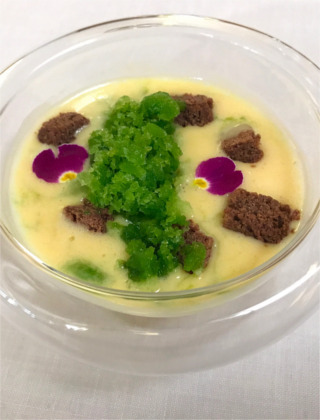 A refreshing crème anglaise of passionfruit with yerba buena (local mint) granita and little chunks of chocolate cake (main picture) prepped our stomachs for the finale: a mango cannellone stuffed with white chocolate and cream cheese bathing in a tropical lemon grass soup. What about the wine? 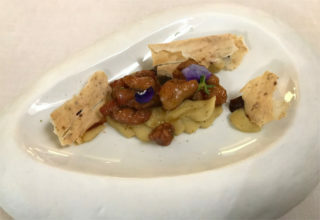 While we were still sipping on our aperitif, a glass of Papirusa – Lustau’s entry level but nevertheless delicate sherry -, the first course came through; as if they knew that the combination of the sherry with razor clam on wonton fried pasta and cauliflower cream was a match made in heaven. The pre-phyloxera Verdejo Naiades 2013 from the Rueda accompanied us cordially throughout the lunch. The sommelier clearly had a good hand in pairing the wine with the food. 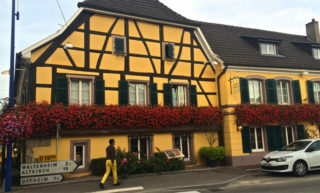 Despite the large number of courses – I haven’t even mentioned the amuses-gueules and the mignardises -, the portioning was such that we felt contented and ready to hit the town. Also the pacing, which flags in many restaurants, was steady and flawless at Abantal. The service ran like clockwork, or more accurately, like a string quartet that has been together for a long time. Just like musicians the waiters and waitresses gave each other small nods to indicate the next course could be served, the glasses of wine needed to be topped up or the plates could be taken away; always discrete and timely, but affable and fun too. Moreover, they knew exactly what they were serving. Never was there a “I need to ask the chef”, although the chef himself was present. Upon leaving we were briefly held up by the staff because they wanted to introduce us to him. 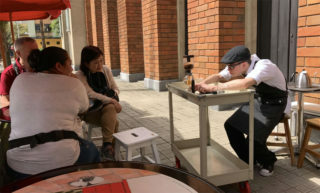 Julio Fernández Quintero is not only a formidable chef, but also a friendly and approachable human being who really wanted to hear our thoughts. 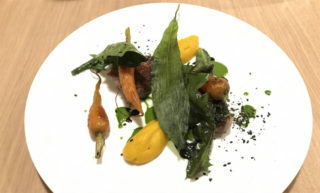 While I write this I realise once again: the team at Abantal delivered a culinary performance where all aspects of an excellent meal came together in a coherent and harmonious way. 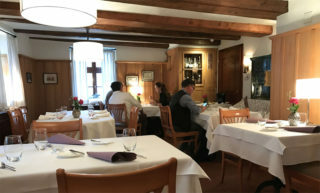 The Basque country and Catalonia have built themselves a reputation for being culinary meccas. However, you would be denying yourself some fantastic gastronomic adventures (read Arrieros too) if you only focus on those two regions. As Barcelona is overcrowded with tourists anyway and the independence struggle hasn’t made it a much happier place either, why not go to Seville and book a table at restaurant Abantal. 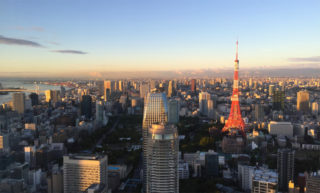 I hope to come back, but if not, I have many good memories to relive.